As part of our Healthy Communities Initiative blog series, we highlight the role of regional Federal Reserve Banks in supporting and enabling cross-sector collaboration across the community development and health sectors. The Federal Reserve Bank of Atlanta is helping forge new relationships between health professionals and community development in order to improve the social determinants of health. Community developers and health professionals often work in the same neighborhoods with the same residents, but they rarely work together in an integrated way to improve people’s health and economic outcomes. That is starting to change. 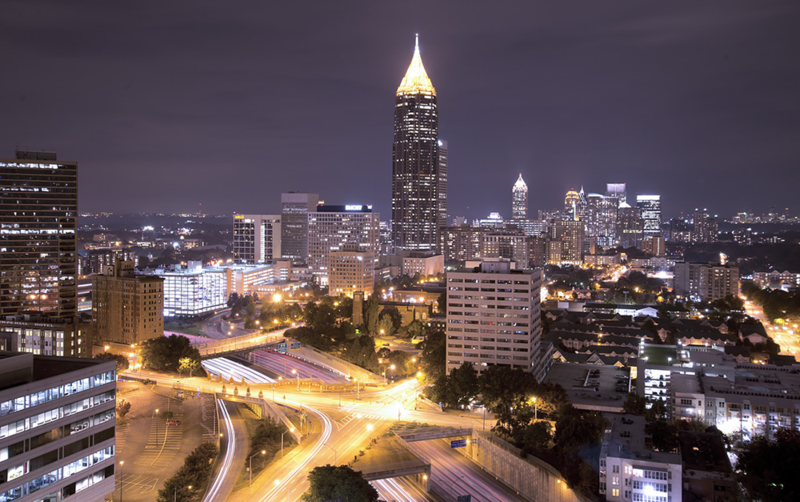 In a new discussion paper, the Atlanta Fed looks at emerging health and community development partnerships in the Southeast. 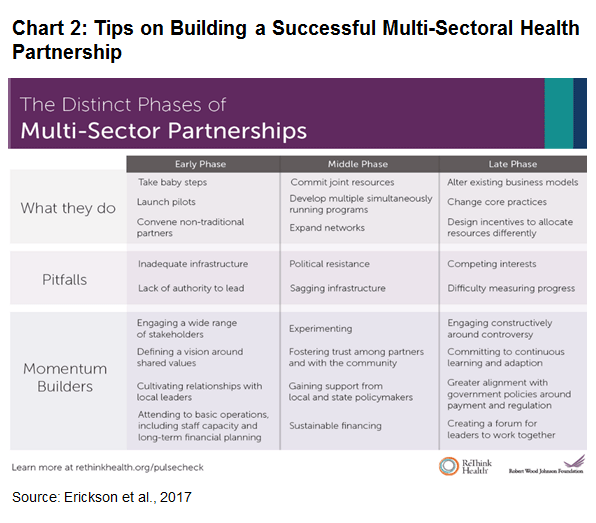 These partnerships are driven, in part, by the health sector’s recognition that clinical care accounts for only 20 percent of health outcomes (see chart 1). 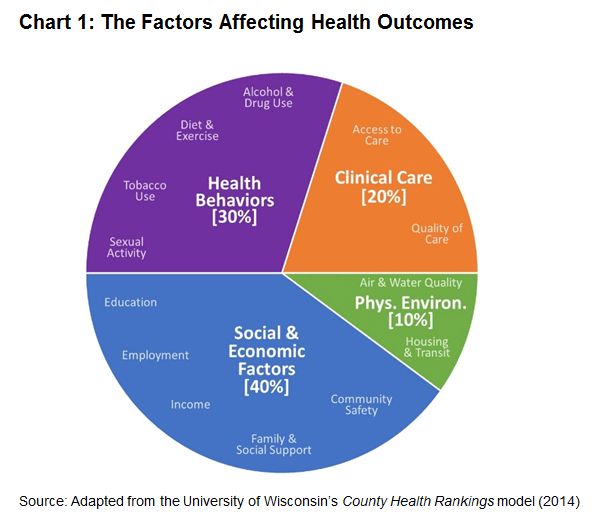 Instead, factors like income and housing ultimately drive health outcomes. Partnering with community developers offers the health sector the ability to address the social determinants of health. State Medicaid officials in South Carolina and Tennessee that use Pay for Success finance both to improve outcomes for Medicaid recipients and control Medicaid costs. 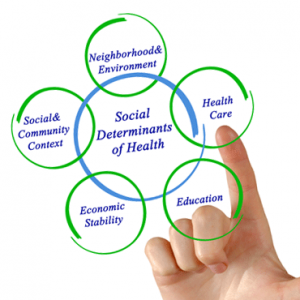 For health stakeholders, community developers can serve as both a disruptive and constructive force in efforts to drive improvements in the health care system’s ability to address the social determinants of health, control spending, and improve quality of care. Community developers’ expertise in crafting multi-sector, public-private partnerships that invest in community-driven projects is powerful. Community developers can devise ways to fund these partnerships through mixing public, philanthropic, and private capital. In this way, community developers can blend market discipline with social purpose. Their expertise in integrating the community’s voice into a given project means community developers know how to build trust with the populations the health sector may be trying to reach. Finally, community developers know how to intervene in the social, economic, and built environment factors that research shows ultimately drive population-level health outcomes. Community developers are learning that health stakeholders can be powerful allies at the local level. Hospitals and health insurers can become a source of grant or investment capital for community development deals. They are also often an influential civic voice, given health care’s role as a leading employer in many regions. In addition, the health care sector can be a source of service contracts for nonprofit service providers, offering a possible new source of funding to this sector. Local governments and philanthropy are recognizing the value of health and community development partnerships. Funding cross-sector collaborations can help governmental actors overcome their own bureaucratic silos and meet fiscal efficiency goals. Medicaid is often the system that most benefits from such collaboration, and its various waiver programs offer states flexibility to experiment with collaboration. Local government can also be a key supporter of these cross-sector innovations, including through leveraging its convening power, as Baton Rouge has shown. The Southeast stands as fertile ground for health and community development collaborations, with an array of poor economic and health indicators across urban, suburban, and rural markets. A recent survey found 65 percent of cross-sector collaborations in health started after 2010, so the field is still in its infancy. To be successful, cross-sector collaboration must address their differences in cultures, languages, and goals (see chart 2). Early innovators have overcome these challenges by hiring a coordinator to manage the collaboration, using data to promote transparency and accountability, and establishing financing and payment mechanisms that support collaboration. The article first appeared as a Federal Reserve Bank of Atlanta Partners Update article in November/December 2017. Sameera Fazili is a senior adviser to the Federal Reserve Bank of Atlanta’s community and economic development (CED) group specializing in economic mobility issues. She has spent her career working in domestic and international economic development, with a focus on inclusive economic growth, access to finance, and social enterprise. Prior to joining the Atlanta Fed, she served as a senior policy adviser at the White House’s National Economic Council where she covered retirement, consumer finance, and community and urban development. Previously, she worked at the Treasury Department, first on issues of domestic policy ranging from community development financial institutions (CDFIs) to housing finance to small business finance, and then as a senior adviser to the undersecretary for international affairs where she served as chief of staff. Before her time in government, she was a clinical lecturer at Yale Law School, where she helped lead the community and economic development clinical program. She also worked at ShoreBank, the nation’s first CDFI bank. Her work in finance has spanned consumer, small business, housing, and microfinance. She received her law degree from Yale Law School and her bachelor of arts in social studies from Harvard College.